How much does it cost to travel to the Cayman Islands? How much money will you need in the Cayman Islands? CI$216 ($259) is the average daily price for traveling in the Cayman Islands. The average price of food for one day is CI$40 ($48). The average price of a hotel for a couple is CI$304 ($364). Additional pricing is in the table below. These average travel prices have been collected from other travelers to help you plan your own travel budget. How expensive is the Cayman Islands? How much money do I need for the Cayman Islands? The Cayman Islands are strikingly beautiful with their white sand beaches, stunningly blue water, and breathtaking snorkeling. The country is made up of a group of islands in the Caribbean Sea, ninety miles south of Cuba. The islands are famous with divers who enjoy the beautiful coral reefs and crystal clear water. The most famous beach in the country is Seven Mile Beach, but the most unique experience is a visit to Stingray City. At this world famous destination you can snorkel in waist deep water while you're surrounded by hundreds of friendly stingrays. Three main islands make up the country. Grand Cayman is the largest island with the highest population. It also has most of the tourist facilities. The other two islands, referred to as Sister Islands, are Little Cayman and Cayman Brac. Little Cayman is the smallest and least developed of the islands. It is only ten miles long and one mile wide and is most popular as a diver's destination. 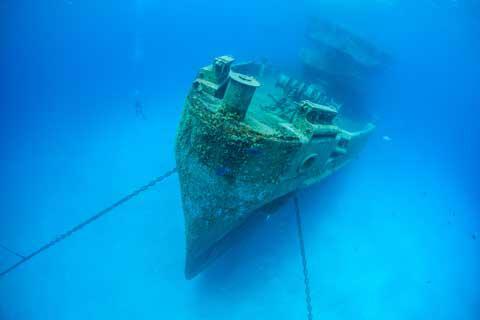 Cayman Brac is fourteen square miles and is also popular for diving, particularly at shipwrecks. The climate in the Cayman Islands is tropical marine. It is generally warm and rainy in the summer (which runs between May and October) and the winter months are cooler and drier. The islands are made up of low-lying limestone that is surrounded by coral reefs. These coral reefs are a major appeal for many divers and snorkelers. The highest point in the country is the Bluff, which is found on Cayman Brac, at 43 meters high. Many people visit the Cayman Islands as part of a cruise, but there are also many regular flights into the country. Accommodation of all types is readily available, although the Cayman Islands are not well know for their all inclusive resorts. Instead, many visitors choose to stay in condominium style apartments or luxury hotels. Many of the hotels are concentrated in the Seven Mile Beach area. Many people choose to rent a car in the Cayman Islands. Vehicles do drive on the left hand side of the road and visitors must obtain a temporary driver's license from the police station or at the car rental agency. To receive this license you must show your valid drivers license from your home country and pay a US$8.00 fee. English is the official language of the islands. Locals are usually friendly and willing to help if you need directions or any form of assistance. There may be subtle variations in local dialect but communication is generally easy and straightforward. There are many places to shop throughout the country but the two most popular shopping destinations are in George Town and Seven Mile Beach on Grand Cayman. Popular items for purchase include jewelry made from black coral, rum cake which can be purchased from Tortuga Rum Company, and caymanite, which is a semi-precious stone from the Cayman Islands. It's also easy to find souvenirs such as t-shirts, hats, postcards, and more. Prices in the Cayman Islands can be high because many items have to be imported. In particular, food is quite expensive. There is typically a 20% import tax on imported items and consumers ultimately pay more because of this. While U.S. dollars are readily accepted everywhere, make sure you fully understand the exchange rate so that you do not overpay for an item. Alcohol is expensive on the islands. You can expect to pay about twice as much for alcohol in a liquor store as you would in the United States. Still, buying your drinks at a liquor store is the most affordable way to purchase alcohol in the country. They are substantially higher in price in restaurants. The Cayman Islands are not known for their all inclusive resorts. Instead, many visitors choose to stay in condominium style accommodation with attached kitchens. This helps them to save on food costs, as restaurant meals can be expensive. Stingray City: This is a world famous spot in the Caribbean where visitors can swim and interact with Atlantic Stingrays. Boats take snorkelers and swimmers to a sandbar where they can stand in several feet of clear blue water while the stingrays swim around them. George Town: This lively town is found on Grand Cayman. It is filled with duty free shops near the waterfront and a variety of international and local restaurants. Rum Point: Found on the quiet, northern side of Grand Cayman, this is a great place to see how the island used to be. The scenery is beautiful and there are restaurants, shops, and hammocks where you can lounge and relax. Food in the Cayman Islands is comparable in style to elsewhere in the Caribbean. There is significant Jamaican influence on the cuisine and seafood is prevalent everywhere. International restaurants are also readily available. Heavy Cake: This is a dense and sweet dessert. It is generally made with a starchy vegetable such as cassava, papaya, and yams. Turtle Stew: This dish is often considered the national dish of the Cayman Islands. The turtles are endangered, but you can taste the stew which is prepared legally through the Cayman Turtle Farm. The stew is prepared with many different spices and the turtle has been compared to either steak or chicken in flavor. Conch: Conch is a favorite delicacy in the Cayman Islands. It is prepared any number of ways, but some of the most popular include being marinated and served in a salad, as part of a creamy chowder, or in a stew.